(Livre du Chevalier de La Tour Landry, in German.) Translated by Marquart von Stein. Third German edition. 220 x 152 mm. – 69 leaves (of 74). Xylographic title, 44 half-page woodcuts, all of which in contemporary colouring. Full title: Der Ritter vom Turn von den Exempeln der gotsforcht und erberkeit. This book is a guide to convey good manners for young ladies of the nobility. The instructions are exemplified by way of role models of good or bad women taken from different classical or biblical sources. La Tour Landry, a nobleman of Anjou, wrote his book for his own daughters around 1371. Marquart von Stein (c. 1430-c. 1496), Landvogt of Mömpelgart and member of one of the oldest Swabian aristocratic families, also had two daughters for whom he claims to have translated the French text. 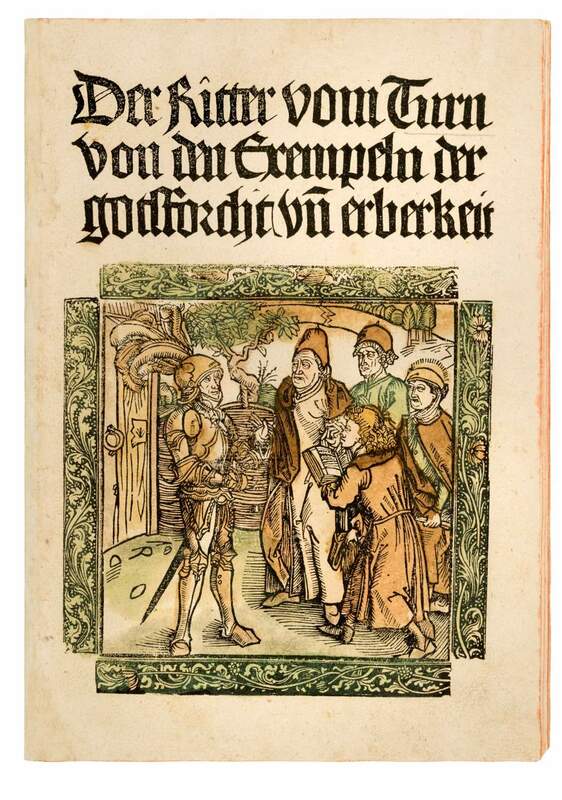 The first edition, Basel 1493, counts as one of the most impressive German illustrated incunables with its woodcuts frequently attributed to Albrecht Dürer. The present Augsburg cuts, first used in Schaur's edition of 1495, are very close copies of the Basel series.